It is an art, a science and a reflection of who you are, for the most part, it is horribly done. Ironic because they tell you once you enter the job market that it is all about your cv, make ten thousand copies. I once wrote a CV that said, I don’t have a CV; if you haven’t heard of me, let it go. If you have, you don’t need the CV. I never got the job. They never even called. The three best CVs I’ve heard of are: the guy who sent one shoe to Harvard and said, at least I have one shoe through the door; the MIT aspirant who sent two dice with sixes on all sides; and an IIT-ian in India who sent a paper kite with the words ‘very high aspirations’ written on it in ink. Most of us write crappy CVs: sniveling esteemed sir or esteemed organisation — esteemed drivel that ensure we don’t get the job. Also called bio-datas, for reasons that still remain a mystery to me, these documents underscore the importance of being earnest. As a result, thousands of aspirants for jobs toil painfully over the details that they hope will serve as the perfect vehicle for their capabilities, their qualifications and their antecedents. These are then dispatched to various personnel and human resource departments with what are known as cover letters in which the applicant lets it be known that he is in the market and ready to be interviewed, raked over the coals and grilled, baked or fried — so far as he gets the job. In a perfect world, CVs would serve as good first-base yardsticks for merit. Unfortunately, the world is cruel and it doesn’t owe you a living. Consequently, most CVs die the same sort of death as roaches and other pests. Even if you, the candidate, are under the fond impression that these credentials are being processed by a squad of in-house intellectuals determined to get the cream of the crop, the odds strongly favour their lying with 300 other such papers in some neglected cupboard from where they will be consigned to that little black bag after being suitably shredded. Of course, if you call to ask what is happening to your precious personal testimonial, you will be told it is under scrutiny. To which assurance there is yet no eloquent or adequate answer except to say, oh, thank you, sorry for disturbing you. It would be safe to say that since 95 per cent of all CVs are identical and make very dull reading, the odds are that you need to work on yours again. The fact that you also labour under the absurd idea that the hand delivered CV clutched in your sweaty little hand is being actually read is incredible in itself. They are just filed, put in a dark corner and thrown away. The flaw lies not in you as much as it does in the way the CV conspiracy has thrived into the 21st century. In the old days, there was no CV. You either belonged or you stood outside the glass pane looking in but were never invited. The old boys club, the right school, the old network, the family tradition, dad’s old friends, the company, of course, excellent connections — that was all there was to it; even if you were a capital cretin, the job was yours. 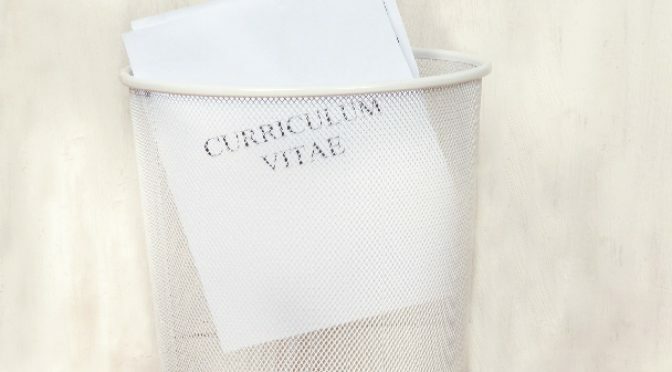 While only the residue still remains of that gracious and viciously unfair nepotism, the average CV still has no chance of winning against these arrangements. Your sincerity, your accomplishments, all your trophies count for very little because, like you, there are two thousand others who have the same credentials. So what exactly do you need to do to belong to that 5 per cent of the human race whose CV catches attention? Okay, first off, forget the gimmicks, they won’t get you the job. There are two aspects. The physical and the written. In the physical, make sure your paper quality is good and crisp, not marked by creases and little food stains. Also, it isn’t dog-eared, badly typed and loaded with spelling mistakes. Then comes the written word. One of the main reasons they fall apart is because CVs are badly written; and they all sound exactly the same that your chances are shot down. Let me share with you the main pitfalls that destroy the bid even before it has a chance to take off. First, the covering letter. Don’t plead, beg, cajole or verbally prostrate yourself because that is sure to offend the sensibilities of the reader. He is running a profit-oriented company, not a charity. Therefore, begging for the job is not going to make you win. So, please don’t go there, it is dangerous. Second, avoid being vague and never display despair, agreeing to do ‘anything’. More people have lost opportunity by offering to do ‘anything’ than for any other reason. If you are ready to do anything, as far as the employer is concerned you are good for nothing. Yet, so many people make that mistake thinking that the employer will be touched. Ha. Third, limit the purple prose. People who write things like eminence, or esquire or excellency, or pepper the page with “sirs” or overdo the syrup are unlikely to go further than the first read. Again, no need to be too smart, too clever or too arrogant. You are looking for a job, not playing a boundary in cricket. They don’t need you, you need them. Also, do your homework and tweak your CV for each application. What fits for one company may not fit another? Priorities. Then, make sure the designation and spelling of the employer’s name are accurate. It is real cheek writing to someone for a job and not even checking out his name. You will be surprised how many people get that wrong. Finally, the shorter the better, never more than one page. If that gets read, you’re lucky. Don’t babble on, your life history is not that interesting. Previous PostHow to deal with kiddie bullies (who turn into nasty adults)Next PostAre trolls nastier when cricket and Bollywood meet?